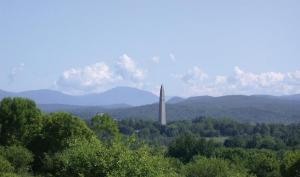 In August of 1777, General John Stark, aided by the Green Mountain Boys, denied British troops access to supplies stored in Bennington, Vermont, by defeating them in a battle just over the border in New York State. 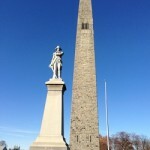 A pivotal event in the American Revolution, the “Battle of Bennington” left British forces woefully unprepared for the later Battle of Saratoga. 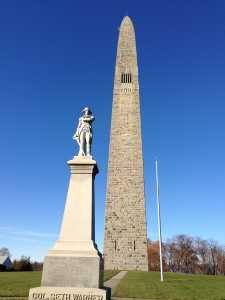 Today, the spectacular 306 foot Bennington Battle Monument stands at the site of the military storehouse. Visitors can take an elevator to the observation floor to view vistas of rolling hills and valleys in the three states. 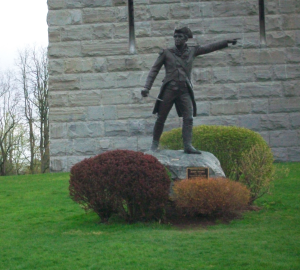 The beautifully landscaped grounds feature additional monuments and interpretive signage. Amenities include a wonderful shop, picnic tables and accessible restrooms. Please allow 30 minutes for your visit. Groups of 10 or more: $3.00 per person. Reservations required.